Heavy rain could trigger mudslides where the Camp Fire and Woolsey Fire burned. Californians are preparing for the worst as heavy rains hit the state just weeks after two fires scorched Northern and Southern California. Over the last eight days, up to 10 inches of rain fell in Central and Northern California, so the ground is very saturated. The recent wildfires left nothing to hold the ground in place so the threat for mudslides is high where the Woolsey and Camp fires burned tens of thousands of acres. A new storm system moved into most of California overnight from north to south with heavy rainfall rates that have reached nearly 1 inch per hour. So far almost 2 inches of rain have fallen in Los Angeles County with more to come. 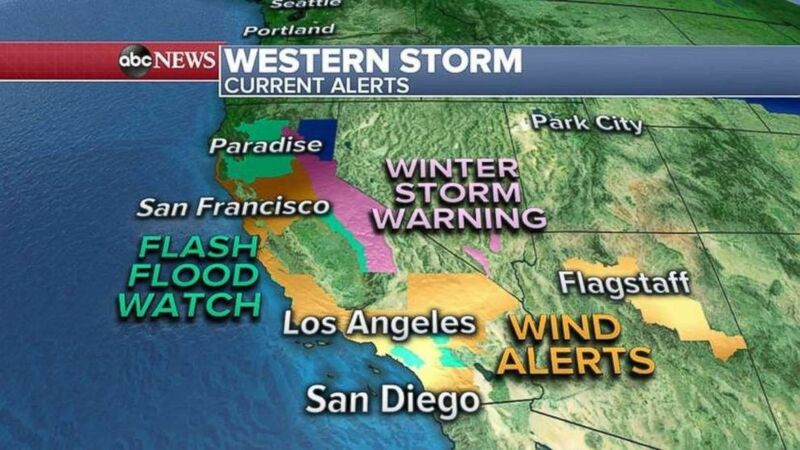 As the storm continues to move through California, numerous flood, wind and snow alerts are posted from California to Nevada and into Arizona. (ABC News) A flash flood watch is in place for the area around Paradise, Calif., and Malibu, Calif., in the wake of this month's fires. As Thursday morning progresses, heavier rain will move into Southern California, around Malibu and Los Angeles, where the Woolsey Fire was located. In the Inland Empire, residents have been told to evacuate parts of Lake Elsinore, Corona and Glen Eden, where the Holy Fire burned about 36 square miles in mid-August. 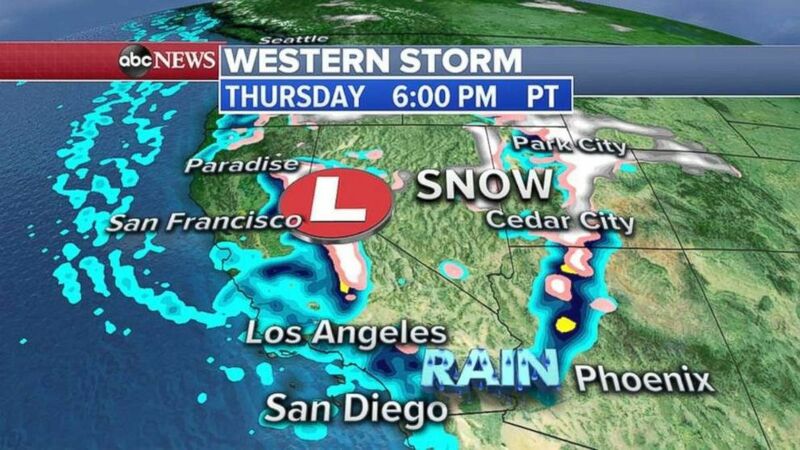 Rain will also continue for Central and Northern California throughout Thursday, while heavy snow will be falling in the Sierra Nevada Mountains. 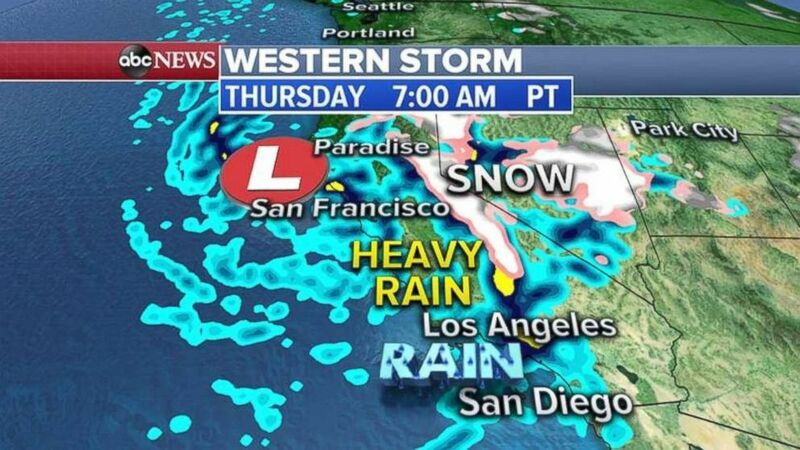 (ABC News) Heavy rain is falling in much of California, while snow falls in the Sierra Nevada Mountains on Thursday morning. The storm system will move inland Thursday evening with the rain continuing for parts of Southern California. It will also move into the southwest deserts of Nevada and Arizona. Snow will spread from the Sierra Nevadas to the central and southern Rockies in Utah, Arizona and Colorado. (ABC News) Heavy rain will continue in Southern California through Thursday evening. An additional 1 to 2 inches of rain is forecast for Southern California through the day Thursday with locally higher amounts. In the Sierra range, snow will pile up by the foot by Friday morning. The snow will also accumulate in feet in the Rockies with some areas getting 1 to 2 feet. 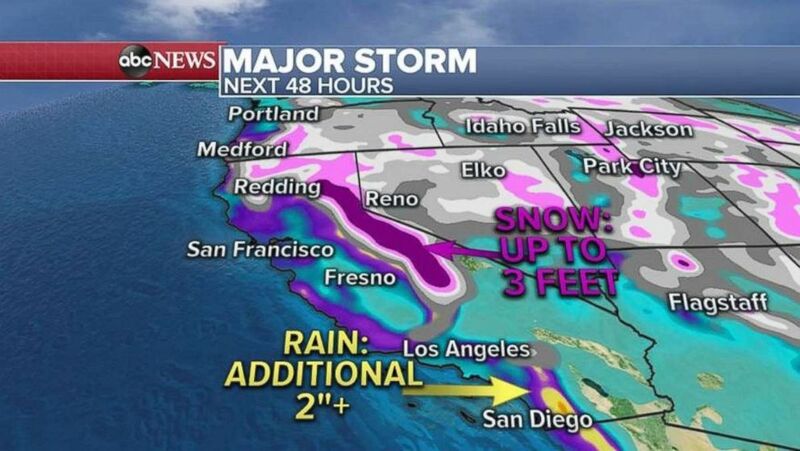 (ABC News) An additional 2 inches of rain could fall in Southern California over the next 48 hours, while ski resorts in the Sierra Nevada Mountains will be buried in snow.